Some of the limitations of end-point detection in (RT-) PCR have been assuaged in real-time PCR systems, various are now on the market. These systems offer many general technical advantages, including reduced probabilities of variability and contamination, as well as online monitoring and the lack of need for postreaction analyses. Further, some of these systems were developed with contemporary applications such as quantitative PCR, multiplexing, and high-throughput analysis in mind. In real-time quantitative PCR techniques, signals (generally fluorescent) are monitored as they are generated and are tracked after they rise above background but before the reaction reaches a plateau. Initial template levels can be calculated by analyzing the shape of the curve or by determining when the signal rises above some threshold value. Several commercially available real-time PCR systems are overviewed and/or summarized in the following sub-page. Each of these systems employs either one of several general types of fluorescent probes for detection. Several different basic types of fluorescent probes are used for real-time PCR applications. Some assays employ general dyes that bind preferentially to double-stranded DNA (SYBR Green 1). Others use target sequence-specific reagents such as exonuclease probes, hybridization probes, or molecular beacons. Although more expensive, sequence specific probes add specificity to the assay, and enable multiplexing applications. Real time PCR or RT-PCR offers numerous advantages over previous attempts at quantitating (RT-)PCR. Other methods typically rely on end-point measurements, when often the reaction has gone beyond the exponential phase because of limiting reagents. To compensate for such problems, competitive PCR was devised, which allows for normalization of the end product based on the ratio between target and competitor. Because this method is cumbersome, requiring a carefully constructed competitor target for each (RT-)PCR reaction and a series of dilutions to ensure that there is a suitable ratio of target to competitor, it is seldom used successfully (absolute quantification). In contrast, with real time (RT-)PCR, the dynamic range is much greater than that of competitive (RT-)PCR - up to 8 orders of magnitude as compared to one with competitive (RT-)PCR -, post-reaction processing is eliminated, and the measurements are taken from the exponential range of the reaction, where component concentrations are not limiting. And best of all, the entire process is automated. Scientific conferences fulfill many roles, but one of the most important ones is that they help shape the direction in which a scientific discipline grows by promoting person-to-person exchanges of information, ideas and constructive criticisms between scientists from different backgrounds. This interaction also helps to identify areas of controversy and promotes efforts to address and, it is hoped, resolve them. This year is the 30th anniversary of the publication of the first practical description of the polymerase chain reaction , arguably one of the simplest and the most widely used molecular technology. It also sees the 7th instalment of the Freising PCR meetings http://www.qPCR-NGS-2015.net, which are the longest established, continuous and most influential conferences in this field and have provided a looking glass for conceptual and technical innovation as well as practical applications of PCR-associated methods. qPCR Guide CoverThe polymerase chain reaction (PCR) is a rapid, sensitive, and rather simple technique to amplify DNA, using oligonucleotide primers, dNTPs and a heat stable Taq polymerase. With the introduction of real-time PCR in the late nineties, the PCR method overcame an important hurdle towards becoming ‘fully quantitative’ (and therefore known as quantitative PCR, or qPCR). Currently, qPCR is regarded as the ‘gold standard’ in the quantitative analysis of nucleic acids, be it DNA, RNA or micro-RNA molecules. The main reasons for its success are its high sensitivity, robustness, good reproducibility, broad dynamic quantification range, and very importantly, affordability. However, completing qPCR assays to a high standard of analytical quality can be challenging for a number of reasons, which are discussed in detail in this guide. qPCR has a large number of applications in a wide range of areas, including healthcare and food safety. It is therefore of paramount importance that the results obtained are reliable in themselves and comparable across different laboratories. This guide is aimed at individuals who are starting to use qPCR and realise that, while this method is easy to perform in the laboratory, numerous factors must be considered to ensure that the method will be applied correctly. The guide aims to assist those who are, or will be, using qPCR by discussing the issues that need consideration during experimental design. The guide entails “tried and tested” approaches, and troubleshoots common issues. Reverse transcription quantitative PCR is an established, simple and effective method for RNA measurement. However, technical standardisation challenges combined with frequent insufficient experimental detail render replication of many published findings challenging. Consequently, without adequate consideration of experimental standardisation, such findings may be sufficient for a given publication but cannot be translated to wider clinical application. This article builds on earlier standardisation work and the MIQE guidelines, discussing processes that need consideration for accurate, reproducible analysis when dealing with patient samples. By applying considerations common to the science of measurement (metrology), one can maximise the impact of gene expression studies, increasing the likelihood of their translation to clinical tools. This meeting was designed to highlight the wide range of new methods, instruments and applications that underlie the popularity of quantitative real-time PCR technology in all areas of life science research, as well as in clinical diagnostics. It provided a fascinating snapshot of current trends and novel approaches, as well as important issues concerning assay design, optimization and quality control issues. Bustin SA, Benes V, Nolan T, Pfaffl MW. Institute of Cellular and Molecular Science, Barts and the London, Queen Mary's School of Medicine and Dentistry, University of London, London, UK. The real-time reverse transcription polymerase chain reaction (RT-PCR) uses fluorescent reporter molecules to monitor the production of amplification products during each cycle of the PCR reaction. This combines the nucleic acid amplification and detection steps into one homogeneous assay and obviates the need for gel electrophoresis to detect amplification products. Use of appropriate chemistries and data analysis eliminates the need for Southern blotting or DNA sequencing for amplicon identification. Its simplicity, specificity and sensitivity, together with its potential for high throughput and the ongoing introduction of new chemistries, more reliable instrumentation and improved protocols, has made real-time RT-PCR the benchmark technology for the detection and/or comparison of RNA levels. The polymerase chain reaction (PCR) is usually described as a simple, sensitive and rapid technique that uses oligonucleotide primers, dNTPs and a heat stable Taq polymerase to amplify DNA. It was invented by Kary B. Mullis and co-workers in the early eighties, who were awarded the 1993 Nobel Prize for chemistry for this discovery. With the discovery of real-time PCR in the nineties the method took an important hurdle towards becoming “fully quantitative”. The addition of an initial reverse-transcription (RT) step produced the complementary RT-PCR, a powerful means of amplifying any type of RNA. Today quantitative PCR (qPCR) is widely used in research and diagnostics, with numerous scientists contributing to the pre-eminence of PCR in a huge range of DNA-, RNA- (coding and non-coding) or protein- (immuno- or proximity ligation assay qPCR) based applications. Soon the PCR was regarded as the “gold standard” in the quantitative analysis of nucleic acid, because of its high sensitivity, good reproducibility, broad dynamic quantification range, easy use and reasonable good value for money. qPCR has substantial advantages in quantifying low target copy numbers from limited amounts of tissue or identifying minor changes in mRNA or microRNA expression levels in samples with low RNA concentrations or from single cells analysis. The extensive potential to quantify nucleic acids in any kind of biological matrix has kept qPCR at the forefront of extensive research efforts aimed at developing new or improved applications. 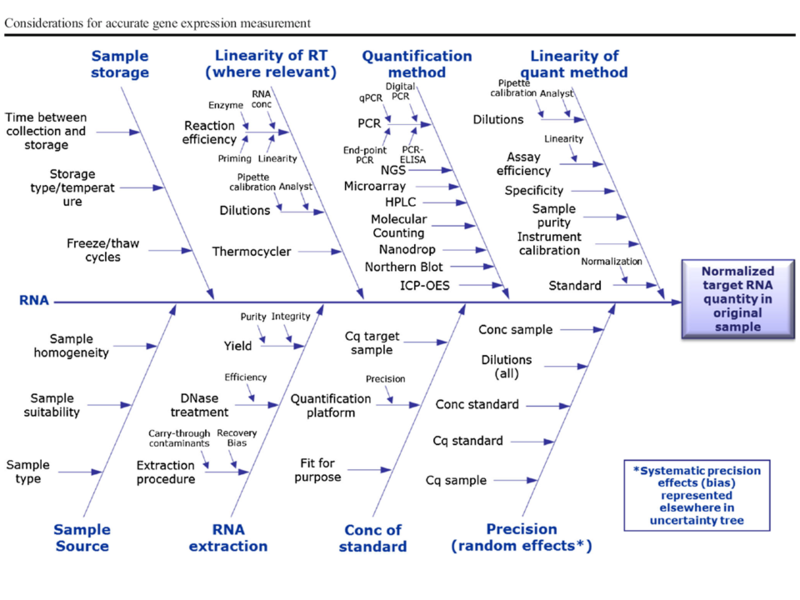 But are qPCR and its associated quantification workflow really as simple as we assume? It is essential to have a comprehensive understanding of the underlying basic principles, error sources and general problems inherent with qPCR and RT-qPCR. This rapidly reveals the urgent need to promote efforts towards more reproducible, sensitive, truly quantitative and, ultimately, more biologically valid experimental approaches. Therefore, the challenge is to develop assays that meet current analytical requirements and anticipate new problems, for example in novel biological matrices or for higher throughput applications. Unfortunately, we are far from having developed optimal workflows, the highest sensitivity, the best RNA integrity metrics or the ultimate real-time cycler, all of which are indispensable for optimal PCR amplification and authentic results. The qPCR research community still aims to improve and evolve, which brings to the topic of this PCR special issue - The ongoing evolution of qPCR. Biological markers (biomarkers) have been used for diagnostic testing for more than 50 years and have acquired immense scientific and clinical value. This process has accelerated in the 21st century, leading to their growing appeal as markers for routine diagnostic practice. There are numerous promising biomarkers, the most important of which are currently used for assessing the efficacy of treatment, development of new drugs, especially in the area of therapeutic medicine for cancer or cardiovascular diseases. In the past, biomarkers were defined as ‘cellular, biochemical or molecular alterations that are measurable in biological media such as human tissues, cells, or body fluids’. Nowadays the term biomarker is defined as ‘a characteristic that is objectively measured and evaluated as an indicator of normal biological processes, pathogenic processes, or pharmacologic responses to a therapeutic intervention or other health care intervention’ by the Biomarker Consortium of the Foundation for the National Institutes of Health (FNIH). A biomarker should be able to reveal a specific biological trait or a measurable change in the organism, which is directly associated with a physiological condition or disease status. Before diagnosis, they provide the potential for screening and risk assessment. As part of the diagnostic process, biomarkers can determine staging, grading, and selection of initial therapy. Subsequently, in the treatment phase, they can be used to monitor therapy success, select additional therapies or monitor recurrent diseases. Real-time PCR, also called quantitative PCR or qPCR, can provide a simple and elegant method for determining the amount of a target sequence or gene that is present in a sample. Its very simplicity can sometimes lead to problems of overlooking some of the critical factors that make it work. This review will highlight these factors that must be considered when setting up and evaluating a real-time PCR reaction. Quantitative PCR -- How does it work? The Quantitative PCR Technical Guide from Sigma-Aldrich is intended to provide new users with an introduction to qPCR, an understanding of available chemistries, and the ability to apply qPCR to answer research questions. 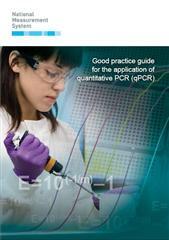 The guide also contains numerous tips and tools for the experienced qPCR user. Real-time PCR is a form of polymerase chain reaction (PCR) in which data are collected in real-time as the reaction proceeds. 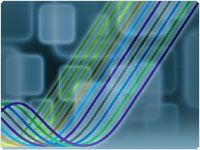 Continuous data collection enables one of the principal applications of real-time PCR, target quantitation. Because quantitation is among the most common uses for real-time PCR, it is often referred to as quantitative PCR or qPCR. Life Technologies™ offers tools to provide reliable real-time results the first time and every time. With trusted Applied Biosystems® instruments and software, TaqMan® Assays and master mixes tailored for success, and innovative products for new real-time PCR research applications, such as digital PCR, castPCR™ rare sequence detection, and even products for protein analysis, we can accelerate your real-time PCR research. Experimental Overview, Protocol, and Troubleshooting. The qPCR Application Guide is intended to provide guidance to users on the entire qPCR process, from RNA isolation to data analysis. 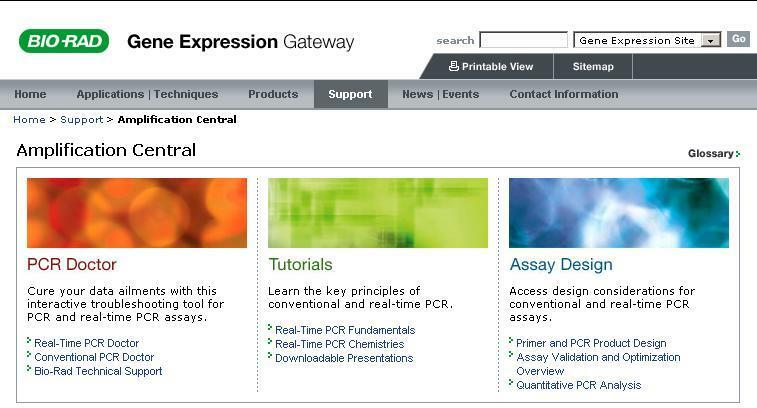 Click to download a pdf of the PrimeTime qPCR Application Guide. Demanding applications such as long-range and multiplex PCR present challenges for scientists. Download our new qualitative PCR and RT-PCR brochure to find out how to achieve the best results from your PCR methods. The real-time reverse transcription polymerase chain reaction (RT-qPCR) addresses the evident requirement for quantitative data analysis in molecular medicine, biotechnology, microbiology and diagnostics and has become the method of choice for the quantification of mRNA. Although it is often described as a ‘‘gold’’ standard, it is far from being a standard assay. The significant problems caused by variability of RNA templates, assay designs and protocols, as well as inappropriate data normalization and inconsistent data analysis, are widely known but also widely disregarded. As a first step towards standardization, we describe a series of RT-qPCR protocols that illustrate the essential technical steps required to generate quantitative data that are reliable and reproducible. We would like to emphasize, however, that RT-qPCR data constitute only a snapshot of information regarding the quantity of a given transcript in a cell or tissue. Any assessment of the biological consequences of variable mRNA levels must include additional information regarding regulatory RNAs, protein levels and protein activity. The entire protocol described here, encompassing all stages from initial assay design to reliable qPCR data analysis, requires approximately 15 h.
Kubista M, Andrade JM, Bengtsson M, Forootan A, Jonak J, Lind K, Sindelka R, Sjoback R, Sjogreen B, Strombom L, Stahlberg A, Zoric N.
Mol Aspects Med. 2006 27(2-3): 95-125. The scientific, medical, and diagnostic communities have been presented the most powerful tool for quantitative nucleic acids analysis: real-time PCR [Bustin, S.A., 2004. A-Z of Quantitative PCR. IUL Press, San Diego, CA]. This new technique is a refinement of the original Polymerase Chain Reaction (PCR) developed by Kary Mullis and coworkers in the mid 80:ies [Saiki, R.K., et al., 1985. Enzymatic amplification of beta-globin genomic sequences and restriction site analysis for diagnosis of sickle cell anemia, Science 230, 1350], for which Kary Mullis was awarded the 1993 year's Nobel prize in Chemistry. By PCR essentially any nucleic acid sequence present in a complex sample can be amplified in a cyclic process to generate a large number of identical copies that can readily be analyzed. This made it possible, for example, to manipulate DNA for cloning purposes, genetic engineering, and sequencing. But as an analytical technique the original PCR method had some serious limitations. By first amplifying the DNA sequence and then analyzing the product, quantification was exceedingly difficult since the PCR gave rise to essentially the same amount of product independently of the initial amount of DNA template molecules that were present. This limitation was resolved in 1992 by the development of real-time PCR by Higuchi et al. [Higuchi, R., Dollinger, G., Walsh, P.S., Griffith, R., 1992. Simultaneous amplification and detection of specific DNA-sequences. Bio-Technology 10(4), 413-417]. In real-time PCR the amount of product formed is monitored during the course of the reaction by monitoring the fluorescence of dyes or probes introduced into the reaction that is proportional to the amount of product formed, and the number of amplification cycles required to obtain a particular amount of DNA molecules is registered. Assuming a certain amplification efficiency, which typically is close to a doubling of the number of molecules per amplification cycle, it is possible to calculate the number of DNA molecules of the amplified sequence that were initially present in the sample. With the highly efficient detection chemistries, sensitive instrumentation, and optimized assays that are available today the number of DNA molecules of a particular sequence in a complex sample can be determined with unprecedented accuracy and sensitivity sufficient to detect a single molecule. Typical uses of real-time PCR include pathogen detection, gene expression analysis, single nucleotide polymorphism (SNP) analysis, analysis of chromosome aberrations, and most recently also protein detection by real-time immuno PCR. The sensitivity of analysis achievable with PCR has led to the technology being adopted across a range of sectors. For many applications a quantitative result is required, which has driven the development of a range of strategies to deter¬mine the amount of starting material in a sample. Approaches such as com¬petitive PCR1 and limiting dilution analysis2 have been used as routes to quantification, although the variable nature of the PCR process and the amplification of the target to a maximal level irrespective of the starting amount of target limit the accuracy of these methods. The advent of kinetic or real-time PCR4 has overcome many of the limita¬tions of earlier strategies, by monitoring the increase in product generated during the course of the reaction, in ‘real time’. Quantitative approaches are based on the time or cycle at which amplification is first detected, rather than requiring quantification of PCR products, and the principle is illustrated schematically in Figure 7.1. A range of samples of known target content are usually amplified together with the samples under test, and the accumulation of PCR product in each cycle is determined. Alternatively the signal from two targets may be compared to determine a relative measure of quantification, and this is often used in measurement of gene expression which is considered in more detail in Chapter 9. BACKGROUND: Currently, a lack of consensus exists on how best to perform and interpret quantitative real-time PCR (qPCR) experiments. The problem is exacerbated by a lack of sufficient experimental detail in many publications, which impedes a reader's ability to evaluate critically the quality of the results presented or to repeat the experiments. CONTENT: The Minimum Information for Publication of Quantitative Real-Time PCR Experiments (MIQE) guidelines target the reliability of results to help ensure the integrity of the scientific literature, promote consistency between laboratories, and increase experimental transparency. MIQE is a set of guidelines that describe the minimum information necessary for evaluating qPCR experiments. Included is a checklist to accompany the initial submission of a manuscript to the publisher. By providing all relevant experimental conditions and assay characteristics, reviewers can assess the validity of the protocols used. Full disclosure of all reagents, sequences, and analysis methods is necessary to enable other investigators to reproduce results. MIQE details should be published either in abbreviated form or as an online supplement. SUMMARY: Following these guidelines will encourage better experimental practice, allowing more reliable and unequivocal interpretation of qPCR results. Real-time PCR is the method of choice for expression analysis of a limited number of genes. The measured gene expression variation between subjects is the sum of the true biological variation and several confounding factors resulting in non-specific variation. The purpose of normalization is to remove the non-biological variation as much as possible. Several normalization strategies have been proposed, but the use of one or more reference genes is currently the preferred way of normalization. While these reference genes constitute the best possible normalizers, a major problem is that these genes have no constant expression under all experimental conditions. The experimenter therefore needs to carefully assess whether a certain reference gene is stably expressed in the experimental system under study. This is not trivial and represents a circular problem. Fortunately, several algorithms and freely available software have been developed to address this problem. This chapter aims to provide an overview of the different concepts. Quantitative real-time RT-PCR (qRT-PCR) is widely and increasingly used in any kind of mRNA quantification, because of its high sensitivity, good reproducibility and wide dynamic quantification range. While qRT-PCR has a tremendous potential for analytical and quantitative applications, a comprehensive understanding of its underlying principles is important. Beside the classical RT-PCR parameters, e.g. primer design, RNA quality, RT and polymerase performances, the fidelity of the quantification process is highly dependent on a valid data analysis. This review will cover all aspects of data acquisition (trueness, reproducibility, and robustness), potentials in data modification and will focus particularly on relative quantification methods. Furthermore useful bioinformatical, biostatical as well as multi-dimensional expression software tools will be presented. The Road from Qualitative to Quantitative Assay. What is next? The PCR reaction is widely used in many applications throughout the world. It has it secure place in the molecular biological history as one of the most revolutionary methods ever. The principles of PCR are clear, but how the reaction procedure can be optimized and how to bring out the best? Where are the fields of improvements? What is the status quo and what is next? SPUD - a quantitative PCR assay for the detection of inhibitors in nucleic acid preparations. Nolan T, Hands RE, Ogunkolade W, Bustin SA. PCR technology is based on a simple principle; an enzymatic reaction that increases the initial amount of nucleic acids. This method makes it possible to detect specific mRNA transcripts in any biological sample. Performing RT-PCR analysis does not only comprehend this experimental PCR step. Following the whole workflow of a RT-PCR quantitative analysis, it starts with the sampling step, followed by nucleic acid extraction and stabilization, cDNA synthesis and finally the qPCR where the mRNA quantification takes place. Problems arise when optimization of the experimental work flow becomes necessary because of high technical variations. The PCR reaction itself is a quite stable reaction with reproducibility between 2-8%. Therefore the source of experimental variances can often be found in the pre-PCR analytical steps. Usually this is neglected and optimization is done for PCR reaction only. In this chapter – RT-PCR optimization strategies - the whole workflow of RT-PCR experiment will be discussed, because the identification of the source of variability is only possible following error accumulation in every single step. Reliable data can be created when the technical variance caused by the experimental steps is kept as low as possible. In this chapter many recommendations to decrease the technical variance can be found. REVIEW: RNA integrity and the effect on the real-time qRT-PCR performance. Fleige S & Pfaffl MW. The assessment of RNA integrity is a critical ﬁrst step in obtaining meaningful gene expression data. Working with low-quality RNA may strongly compromise the experimental results of downstream applications which are often labour-intensive, time-consuming, and highly expensive. Using intact RNA is a key element for the successful application of modern molecular biological methods, like qRT-PCR or micro-array analysis. To verify RNA quality nowadays commercially available automated capillary-electrophoresis systems are available which are on the way to become the standard in RNA quality assessment. Proﬁles generated yield information on RNA concentration, allow a visual inspection of RNA integrity, and generate approximated ratios between the mass of ribosomal sub-units. In this review, the importance of RNA quality for the qRT-PCR was analyzed by determining the RNA quality of diﬀerent bovine tissues and cell culture. Independent analysis systems are described and compared (OD measurement, NanoDrop, Bioanalyzer 2100 and Experion). Advantage and disadvantages of RNA quantity and quality assessment are shown in performed applications of various tissues and cell cultures. Further the comparison and correlation between the total RNA integrity on PCR performance as well as on PCR eﬃciency is described. On the basis of the derived results we can argue that qRT-PCR performance is aﬀected by the RNA integrity and PCR eﬃciency in general is not aﬀected by the RNA integrity. We can recommend a RIN higher than ﬁve as good total RNA quality and higher than eight as perfect total RNA for downstream application. Quantitative real-time PCR for cancer detection: the lymphoma case. Stahlberg A, Zoric N, Aman P, Kubista M.
Expert Rev Mol Diagn. 2005 5(2): 221-230. TATAA Biocenter, Medicinaregatan 7B, 413 90 Gothenburg, Sweden. Advances in the biologic sciences and technology are providing molecular targets for diagnosis and treatment of cancer. Lymphoma is a group of cancers with diverse clinical courses. Gene profiling opens new possibilities to classify the disease into subtypes and guide a differentiated treatment. Real-time PCR is characterized by high sensitivity, excellent precision and large dynamic range, and has become the method of choice for quantitative gene expression measurements. For accurate gene expression profiling by real-time PCR, several parameters must be considered and carefully validated. These include the use of reference genes and compensation for PCR inhibition in data normalization. Quantification by real-time PCR may be performed as either absolute measurements using an external standard, or as relative measurements, comparing the expression of a reporter gene with that of a presumed constantly expressed reference gene. Sometimes it is possible to compare expression of reporter genes only, which improves the accuracy of prediction. The amount of biologic material required for real-time PCR analysis is much lower than that required for analysis by traditional methods due to the very high sensitivity of PCR. Fine-needle aspirates and even single cells contain enough material for accurate real-time PCR analysis. Real-time PCR has become one of the most widely used methods of gene quantitation because it has a large dynamic range, boasts tremendous sensitivity, can be highly sequence-specific, has little to no post-amplification processing, and is amenable to increasing sample throughput. However, optimal benefit from these advantages requires a clear understanding of the many options available for running a real-time PCR experiment. Starting with the theory behind real-time PCR, this review discusses the key components of a real-time PCR experiment, including one-step or two-step PCR, absolute versus relative quantitation, mathematical mod-els available for relative quantitation and amplification efficiency calculations, types of normalization or data correction, and detection chemistries. In addition, the many causes of variation as well as methods to calculate intra- and inter-assay variation are addressed. Absolute quantification of mRNA using real-time reverse transcription PCR assays. The reverse transcription polymerase chain reaction (RT-PCR) is the most sensitive method for the detection of low-abundance mRNA, often obtained from limited tissue samples. However, it is a complex technique, there are substantial problems associated with its true sensitivity, reproducibility and specificity and, as a quantitative method, it suffers from the problems inherent in PCR. The recentintroduction of fluorescence-based kinetic RT-PCR procedures significantly simplifies the process of producing reproducible quantification of mRNAs and promises to overcome these limitations. Nevertheless, their successful application depends on a clear understanding of the practical problems, and careful experimental design, application and validation remain essential for accurate quantitative measurements of transcription. This review discusses the technical aspects involved, contrasts conventional and kinetic RT-PCR methods for quantitating gene expression and compares the different kinetic RT-PCR systems. It illustrates the usefulness of these assays by demonstrating the significantly different levels of transcription between individuals of the housekeeping gene family, glyceraldehyde-3-phosphate-dehydrogenase (GAPDH). Quantification of mRNA using real-time reverse transcription PCR: trends and problems. The fluorescence-based real-time reverse transcription PCR (RT-PCR) is widely used for the quantification of steady-state mRNA levels and is a critical tool for basic research, molecular medicine and biotechnology. Assays are easy to perform, capable of high throughput, and can combine high sensitivity with reliable specificity. The technology is evolving rapidly with the introduction of new enzymes, chemistries and instrumentation. However, while real-time RT-PCR addresses many of the difficulties inherent in conventional RT-PCR, it has become increasingly clear that it engenders new problems that require urgent attention. Therefore, in addition to providing a snapshot of the state-of-the-art in real-time RT-PCR, this review has an additional aim: it will describe and discuss critically some of the problems associated with interpreting results that are numerical and lend themselves to statistical analysis, yet whose accuracy is significantly affected by reagent and operator variability. Reverse transcription (RT) followed by polymerase chain reaction (PCR) is the technique of choice for analysing mRNA in extremely low abundance. Real-time RT-PCR using SYBR Green I detection combines the ease and necessary exactness to be able to produce reliable as well as rapid results. To obtain high accuracy and reliability in RT and real-time PCR a highly defined calibration curve is needed. We have developed, optimised and validated an Insulin-like growth factor-1 (IGF-1) RT-PCR in the LightCycler, based on either a recombinant IGF-1 RNA (recRNA) or a recombinant IGF-1 DNA (recDNA) calibration curve. Above that, the limits, accuracy and variation of these externally standardised quantification systems were determined and compared with a native RT-PCR from liver total RNA. For the evaluation and optimisation of cDNA synthesis rate of recRNA several RNA backgrounds were tested. We conclude that external calibration curve using recDNA is a better model for the quantification of mRNA than the recRNA calibration model. This model showed higher sensitivity, exhibit a larger quantification range, had a higher reproducibility, and is more stable than the recRNA calibration curve. growth factor-1 (IGF-1) RT-PCR using LightCycler SYBR ® Green I technology. The 4th segment during the amplification program melts unspecific LightCycler PCR products at 85°C, eliminates the non-specific fluorescence signal and ensures accurate quantification of the desired IGF-1 products (figure 2). High temperature quantification keeps the fluorescence of the no template control around 1 unit, while the specific IGF-1 signal rises up to 40-50 fluorescence units. SYBR ® Green I determination at 85°C results in reliable and sensitive IGF-1 quantification with high linearity (correlation coefficient r = 0.99) over seven orders of magnitude (102 to 109 RNA start molecules; lower figure). In contrast, a conventional determination at 72°C results in a truncated quantification range (r = 0.99) over only four orders of magnitude (105 to 109 RNA start molecules; upper figure).